Finding a suitable speaker for a smaller apartment can be more than challenging. Larger speakers usually have higher capabilities and in smaller objects, they do more bad than good. 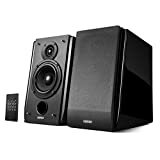 However, various manufacturers introduce bookshelf speakers as a more convenient way to use your space for watching movies or listening to the music. Edifier R1850DB active bookshelf speakers are one of those. In this article, we deliver a carefully compiled review which looks at the innovative features of the bookshelf speaker as well as its most notable pros and cons. If you are springing for a compact pair of speakers on a relatively accepted budget, Edifier R1850DB could perhaps be the right companion for you. Would you like to get some idea about What is a good Bluetooth Bookshelf Speaker? Read our Bluetooth Bookshelf Speakers – A comprehensive Buying Guide first. It’s no secret that the audio performance of any speaker, in particular, is much more vibrant when used with a cable rather than a wireless network. However, sometimes, you will agree, that the flexibility is one of the best properties a speaker can have. With that said, Edifier R1850DB is equipped with many different options that assure near flawless performance. The speakers are equipped with either digital and analog inputs, RCA/AUX with 3.5mm plug are dedicated for those who want the speakers to accompany their PC during deep musical listening, watching movies, working or just more lively gaming experience. The same audio plug can as well be used for turntables if you are up for a party. The lossless and reliable experience is given through an optical and coaxial cable, that is one of the most reliable connections available. However, those who enjoy flexibility and portability and wish to stream music from their phone, tablet, or laptop wirelessly, Bluetooth V4.0 version will make that possible. Nevertheless, we can’t help but hope for a more recent Bluetooth version for this model. Although V4.0 version can meet most of the demands, newer versions like V 4.1 and 4.2 make up for even greater experience. Still, this is going to suffice most of the people who only want to relax with high-quality speakers. While most speakers and music units do come with remote controls that accompany them, Edifier R1850DB implements its old technology, enhancing the quality of music and convenience by adding a wireless controller. This handy and compact tool will enable you to make an input selection, adjust the volume the way you’d like it, and track control of the Bluetooth technology. Buying and receiving speakers, or any high-end product in particular, just to find out that it’s malfunctioning and not providing you with the experience that you expected can be quite frustrating. However, don’t be spooked about Edifier’s reliability. Edifier R1850DB comes to you packed up with a warranty. The company promises that the speaker has nothing less than the highest quality, being construct with reliable parts and being sufficiently sturdy for the good-quality music. Nevertheless, if some components start to fall apart, Edifier will be happy to assist your speaker thanks to the 2-year warranty. Features of Edifier R1850DB promise a fun experience. Not many manufacturers offer such quality experience with so many connecting options and quite the reliability. The older version of Bluetooth is kind of a lackluster, although no one who doesn’t pay attention to such small things will really notice the difference. We gave it 4 out of 5 stars. The design is also an important factor of every speaker, not just for the aesthetics and how it fits in your shelf in the living room, but also its sturdiness and firm construction can tell how good it will cope with the woofer and on-demand subwoofer. The speaker weighs 16.71 pounds and measures 18.1 x 12.2 x 7.9 inches. That being said, it’s not too big and can fit absolutely anywhere, in case you have a big house and its Bluetooth signal can’t reach to your room. You can conveniently take it to another room because it’s not too heavy. Angle design is a feature oftentimes discovered on bookshelf speakers, as it adds to their style. However, this design, in particular, helps direct the sound towards the direction that is convenient to the user. As the company notes the speakers are “design with a purpose.” To point out the audio capabilities and make it as comfortable as possible to the listener. The medium-density fibreboard [MDF] closing will ensure that the harmonic distortion is reduced. That means that if users prefer loud music, sturdy and firm housing will minimalize distortion and vibrations that give the sound a bad name. The case is undoubtedly sturdy and won’t cause any problems with the performance. Also, the base of the speaker was made to be in an angle at a 10-degree incline, which works with a purpose to create dynamic precision when it comes to the sound delivery. It makes the sound coming from the woofers to be angled and directed towards user’s ears. Pianos are elegant yet powerful, and so is Edifier R1850DB. It is covered in a piano finish, which adds to its elegance and sophistication. The piano black finish looks wonderful and it makes the speakers easily attractable to any surface in your house or apartment. Edifier aimed to deliver great design and put it into compact bookshelf speakers. So far it succeeded and it acquired the highest grade in our review 5 out of 5. As mentioning at the beginning of the article, finding an affordable, yet powerful speaker is more than just challenging. Mainly because although great, features and design can’t always make us predict how some product performs. Thanks to the black enclosure of the speaker and an angled design which serves to direct the sound, we know that the sound should be firm and that the harmonic distortion will be minimized through the speakers. However, how does it perform and does it suffice our needs? The speaker is equipped with grills that give a user an opportunity to nicely place a grill or take them off. That way, users can be presented with the tweeters and mid-range drivers which operate with the midstage. The speakers produce 70 watts of sound that is balanced and clear. For everyone who has the knowledge, this speaker is not just stylish but it provides vibrant and deep sound. The midrange woofer speaker drivers that measure 4.5-inches are capable of creating rich lows, while the treble’s capabilities deliver impeccable highs. The speaker is equipped with the Digital Signal Processing (DSP) and also Dynamic Range Control (DRC.) These units work in a way that allows even more harmonic distortion to be minimized, and that way they contribute to even higher volume of music without distortion. Inside speakers, a built-in class D amplifier helps provide power to the speakers in a way that doesn’t require receivers or an external amplifier but instead provides a room-filling, near-surround sound. Edifier R1850DB gives room to even more bass for your personal needs. The 2.0 system allows even more bass thanks to the subwoofer output which can swiftly connect a subwoofer and transform the speakers into 2.1 system. Those who prefer a good bass can add another subwoofer and create ground shaking, powerful experience. The speaker is equipped with the Bluetooth v4.0 that has a reliable connection to every Bluetooth-supported device including smartphones, tablets, and laptops. The connection is quite reliable and it covers a range of 33 feet (10 meters.) Even though the connection is firm, stepping away too much can result in distorted sound and loss of signal. Also, the walls don’t represent too much of a barrier, although it’s advised to still not get out of the 33 feet range. Don’t Miss Our 10 Best Wireless Subwoofer for Home Article. The performance is quite satisfactory for the price, especially the subwoofer output that allows us to transform speakers into a whole system. We give performance section 5 out of 5. 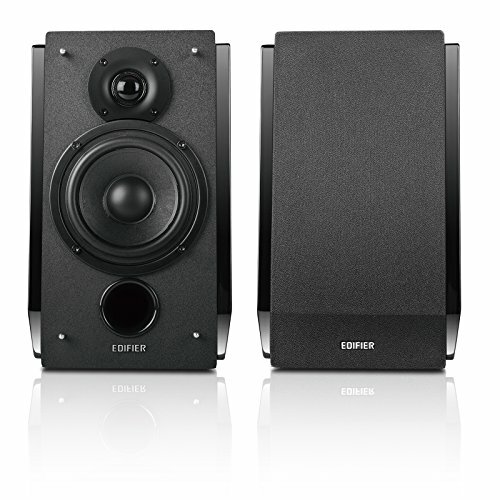 Edifier R1850DB is a pair of great speakers. However, at this pricing, it’s far from perfect. There are still more affordable units or systems that also can deliver high-quality sound and not compromise flexibility and comfort. Still, the price is still somewhat okay, which is why we give it 4 out of 5 stars. Older Bluetooth version may not attract customers who gladly embrace the newest technologies. If you live in a small apartment or house, looking for a portable speaker but don’t have money to spend on high-end speakers, Edifier R1850DB is exactly what you need for enjoying the spacious, detailed and warm sound, with upgradable space for a subwoofer. 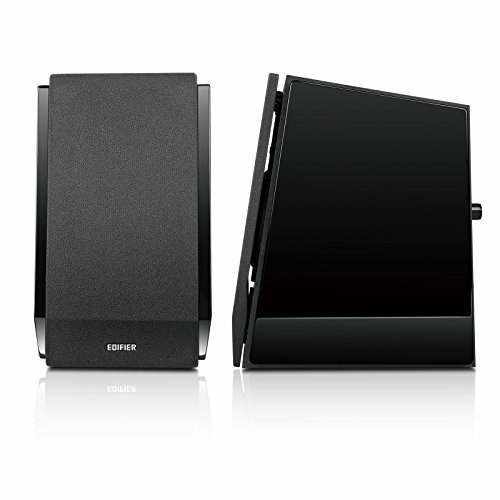 Edifier R1850DB stands for a quality, great soundstage, and portability with various useful features. Aside from being compact and suitable for every area of your house, it also offers a great variety of connectivity options RCA, AUX, Bluetooth, optical and much more. Additionally, it has an extra output for plugging a subwoofer, for those fond of good bass. The mids and treble is clear, deep and detailed, which is exactly what budget-friendly bookshelf speakers should have.